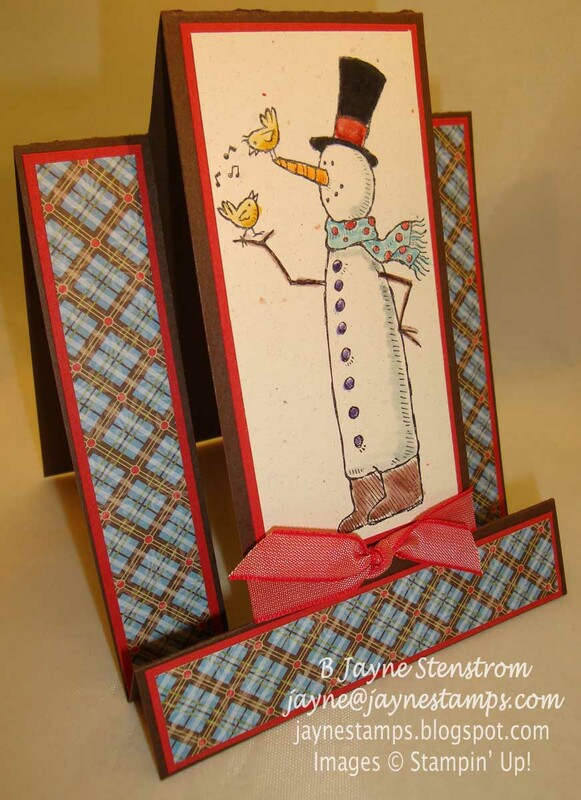 We're having our "January thaw" here in Michigan - even though we really haven't had much winter weather. It was almost 50 degrees today, which is pretty much unheard of for early January! So the only snowmen we have around here are the ones that have been stamped. 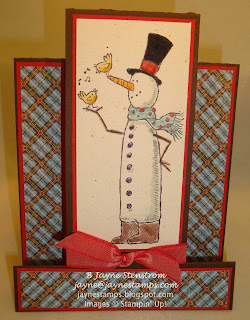 This particular card (or at least the pieces for it) was given to me by my friend Debra. 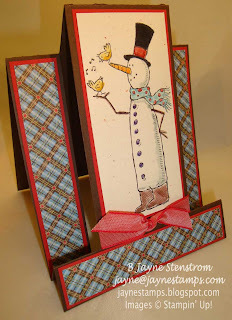 She had stamped the snowman and given me the DSP pieces along with the "pattern". I've posted other cards cut and folded this same way - one of them was HERE. If you'd like the pattern, just leave me a comment along with your e-mail address and I'll be happy to send it to you. I put the card together quite awhile ago and it's been sitting on my desk, but I just finally finished coloring it tonight. The images were watercolored with dye-based inks (actually marker inks scribbled on the top of a stamp box) and a blender pen. I'm also trying out my new light box for taking pictures. Since I have a small-ish camera without a lot of bells and whistles, I have to try out different settings to see what works best with the light box. So this is my first attempt. Hmmm.... maybe I'll have to get a better camera so I can take better pictures! Cute Jayne. Picture looks good too.